In some areas of London we run volunteer responder schemes, where members of the public with clinical skills or emergency life-support training respond alongside our staff to life-threatening 999 calls. Crucially, all these volunteers carry defibrillators – a machine that can restart the heart when it stops beating. Early use of a defibrillator doubles a patient’s chance of survival if they are suffering a cardiac arrest. 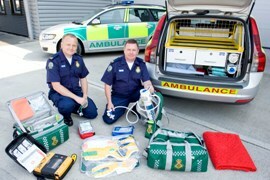 Emergency responders – clinically-trained volunteers responding on blue lights alongside ambulances to 999 calls. Community first responders – defibrillator-trained St John Ambulance volunteers attending on call from their homes and responding to 999 calls in their own car without blue lights alongside ambulances. Volunteers at public-access defibrillator sites – there are over 750 defibrillators in public places like train stations and shopping centres in London. People who work at these locations are trained to use the defibrillators and respond to emergencies while an ambulance is on the way.